Subscribe to Estates Gazette to read articles like this every week. Take advantage of our special introductory offer. One of the West End’s most-watched sites is being prepared for a sale that will clear the way for a £600m development. 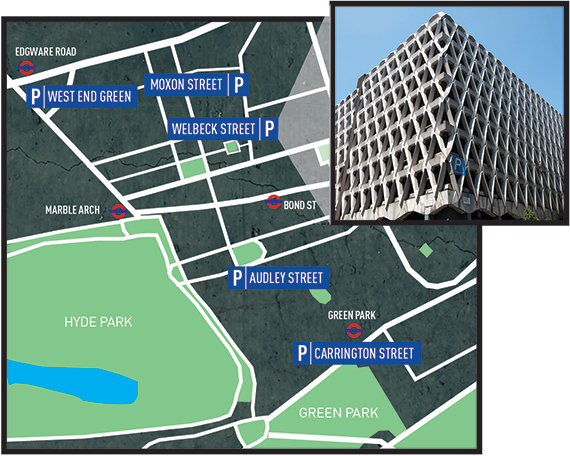 LaSalle Investment Management’s prominent NCP-operated car park at 74-77 Welbeck Street, W1, is the latest core West End car park to come up for sale. Skyrocketing values in W1 for both offices and residential have prompted owners of car parks to sell their assets as opportunities for conversion to other uses. A £75m price tag has been placed on the prime 108,000 sq ft corner site property near Bond Street Station and behind Debenhams, which was valued at just £30m at the end of last year. Local sources expect bids to exceed £100m. The site is expected to accommodate a 200,000 sq ft development including 100,000 sq ft of offices, ground-floor retail and top-level residential. The site also has the potential for hotel use. It is let to NCP until 2021, with a lease break in 2016. Ground-floor tenants include restaurant MeatLiquor and lap-dancing club SophistiCats. The sale is understood to have been triggered by a recent English Heritage decision not to list the nine-storey building, combined with the frenzied demand for scarce core West End development sites ahead of the opening of Crossrail in 2018. Over the past few years London councils have been seeking to discourage car use in the city centre, and to utilise car park sites to capitalise on their potential value. JLL has been appointed to begin marketing the freehold site later this year for a sale in 2016, when an overage agreement with NCP concludes. Estates Gazette subscribers benefit from vital market intelligence that allows them to find new opportunities and make informed business decisions. Take advantage of our introductory offer. Try 4 issues for £1.